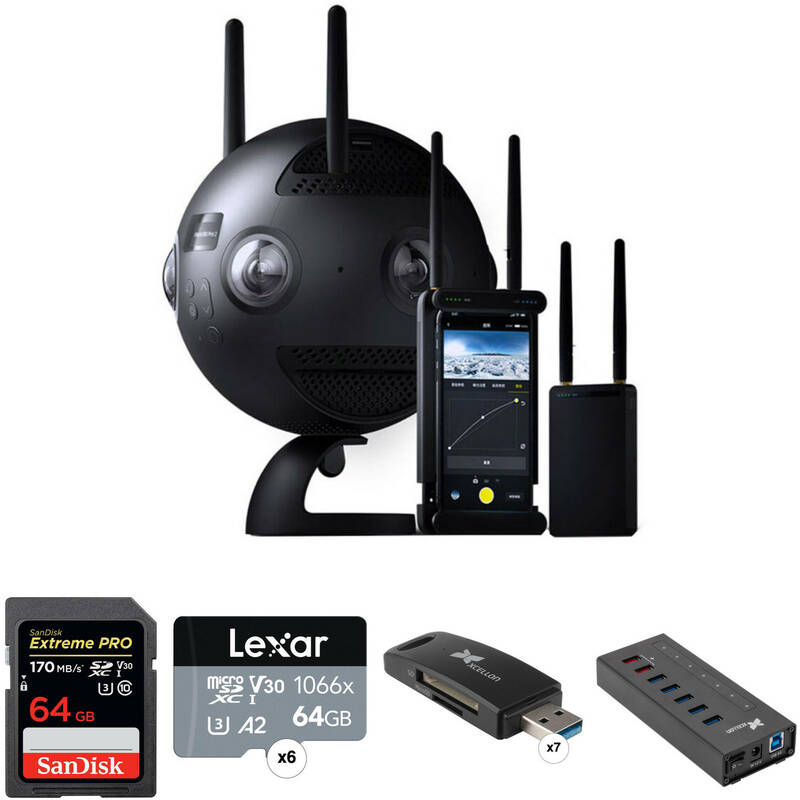 The Insta360 Pro II Spherical VR 360 8K Camera and Memory Kit from B&H bundles the 8K 360° camera with a set of memory cards and card readers to get you started recording. This kit includes six 64GB microSDXC cards, one 64GB SDXC card, seven card readers, and one 7-port USB hub. The Insta360 Pro II VR Camera with FarSight bundle from Insta360 captures 360 spherical VR videos and stills in configurations up to 8K 3D. This successor to the Insta360 Pro can record immersive 8K video while streaming in 4K and includes the FarSight remote monitoring system. Insta360 Pro II features include precise 9-axis FlowState stabilization, CrystalView monitoring on standard devices, automatic proxy file creation, and stitch-free editing in Adobe Premiere Pro. The FarSight 360° long-range monitoring system includes a transmitter and receiver for live monitoring your capture from up to one mile away ground-to-ground, or two miles ground-to-air. Wi-Fi preview is available at 30 fps up to 15' without using FarSight. The CrystalView function converts 8K VR footage for viewing on popular 4K VR headsets and standard smartphones or monitors, expanding your potential audience. Save time and processing with the Insta360 Pro II's ability to create proxy files for instant stitching and real-time editing in Adobe Premiere Pro. When you have your final cut, the Insta360 algorithm stitches together a full-resolution version. Each camera records to a microSD card while proxy files and stabilization data are captured to a full SD card. The camera features bit rates up to 120 Mb/s, and records audio via four built-in mics and a 3.5mm mic input. The Insta360 Pro II's optical features include six selectable 200° fisheye lenses, adjustable shutter speed, and an ISO range of 100-6400. An HDR (high dynamic range) function provides natural-looking lighting even in unevenly lit settings. High-speed frame rates are available up to 120 fps and the still mode includes raw, JPEG, burst, and time-lapse options. Image stabilization is a vital VR component and the Insta360 Pro II combines a 9-axis gyro with the downloadable Insta360 software for precise, customizable stabilization. A built-in GPS module provides data for Google Maps Street View, and other precision-mapping applications. The Insta360 Pro II features a compact aluminum frame, two USB ports, and a hot swap battery dock. Captures 8K 360 videos and stills in 3D up to 30 fps and 2D up to 60 fps. Transform a single USB 3.0 port from a notebook, tablet, or desktop into seven USB 3.0 ports—with two performing double duty as charging ports—with the Powered USB 3.0 Slim Aluminum Hub from Xcellon. Each of the seven ports is outfitted with USB 3.0 technology that enables it to transfer data at rates of up to 5 Gb/s. When used as a stand-alone hub, the two charging ports can each deliver up to 2.4A of current for recharging tablets, smartphones, and other power-hungry devices at the same time. Furthermore, the hub is backward compatible with USB 2.0 and 1.1 interfaces and supports a wide-variety of systems, including Windows, Mac, Chrome, and Linux. When compared to the previous version, this Xcellon hub features a slimmer design as well as a redesigned power system, which provides a toggle switch and the ability to automatically turn on when the host computer is powered on or restarted. Moreover, the slim design and rubber treads allow the hub to stay upright while unplugging and plugging in USB cables. Xcellon has constructed this 7-port hub of heat-dissipating aluminum and includes a dual-voltage power adapter for ensuring ample power flows to your USB-connected devices, while reducing the strain on the host system's components. Aside from power, LED indicators are located next to each port, so you can see the power status of each individual USB port. There's also an included 3.3' (1m) USB 3.0 cable that lets you start using this hub right away. 3840 x 3840 120 fps binning. Box Dimensions (LxWxH) 19.5 x 17.0 x 9.0"
Box Dimensions (LxWxH) 7.6 x 4.0 x 3.8"